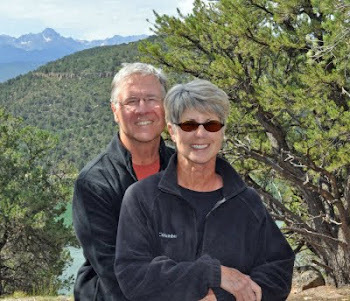 Find us on Google+ Rick and JoAnne's RV Travels: I’m a little behind…ya think?! I’m a little behind…ya think?! 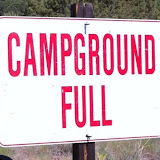 We have been so busy since July 4 I have to admit I have been negligent in my postings. So much has happened, so many adventures. Our friends Jane, Ty & Beth Fouchey, Lois & Hal Leslie, and our daughter Andrea and her husband Roger brought our grandson Caleb to visit with us for a week. It was all great! I have to say it went by in such a flash however, I am thankful to have the photos to help bring back some wonderful memories! Caleb and Rick went kayaking, and fishing, and while I was working in the visitor center, the two of them cleaned campsites. Caleb also worked on his volunteer hours here at Ridgway State Park, and earned his Junior Ranger Badge. We also were able to go to the Railroad Museum in Ridgway, the Ute Indian Museum and swim beach here at the park. We are very proud of him, and extremely grateful we were able to help celebrate his 9th birthday with him while he was here camping with us. The whole group went on the Bachelor-Syracuse Mine Tour. What an experience that was! It was interesting but most definitely NOT for anyone who is claustrophobic…like me! Gold pannin’ - Caleb was the only one who found gold! The 4th of July fireworks in Ouray were amazing! They began the event by Jeeps’, decorated in everything right, white and blue…and red flares proceeding down the Million Dollar Highway towards the town of Ouray. What a site! When that procession was completed, the fireworks began. The sound just bounced from one canyon wall to another; along with the incredible display…well…it was breathtaking! The quiet hours here are from 10PM to 6 AM – but that did not stop our nightly campfires! It was wonderful to see, and be with everyone! I hope you take a few minutes to share in our memories! Jul 16, 2011 I'm a little behind...Really?! Are you going to go for another year? Same place?...or try for some place else? Eileen - Thanks for sharing your blog. Yes, we are going for another year at Ridgway. We are also going down to Galveston Island State Park and Camp Host for the month of November.